These two intrepid felines have spent the last two years trying to enter an art museum – and the internet has become fascinated by their escapades. The Onomichi Museum in western Japan first started documenting the efforts of their furry visitors back in 2016 when a black cat, who they later named Ken-chan, spotted a cat photography exhibit that was on display beyond the automatic doors. Though some people might scoff that a cat would have an interest in feline photography (everybody knows that cats prefer oil pawstels anyway), Ken-chan started regularly trying to get into the museum. Soon, Ken-chan picked up a partner in crime: a ginger cat that the museum named Go-chan. Over the course of the last two years, Ken-chan and Go-chan have made dozens of valiant attempts to get into the gallery. 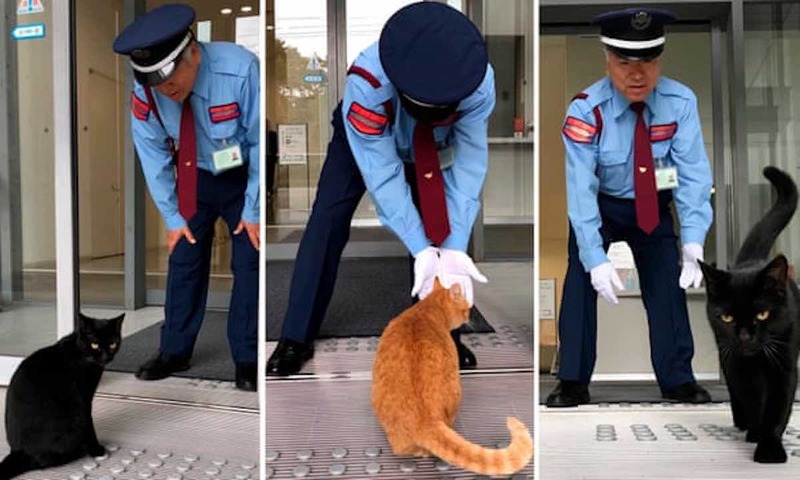 Though they have developed a sweet rapport with the security guard, he has always dutifully sent them away – after giving them a quick pat on the head, of course. Since the museum started posting pictures and videos of their little patrons to their official Twitter page, social media users have implored the staffers to let the cats inside for a visit. Despite the internet pleas, we’re sure that the museum staffers would agree with Indiana Jones in saying that cats do not belong in a museum. They have not excluded the dynamic duo from their museum entirely, however; the staffers have started selling Ken-chan and Go-chan merch in their gift shop, although they have had trouble keeping up with demand since their cat photos started being shared by news outlets around the world. Perhaps Ken-chan and Go-chan are long lost cousins of the Pink Panther and they’re simply staking the joint before their heist; or maybe they just have an appreciation for the finer things in life. Regardless of their intentions, we’re waiting for the museum to hire an illustrator who can turn this story into the purrrrfect children’s book.